Professional football is of course a grueling sport. Injury reports are part of the landscape. Knee injuries are common. 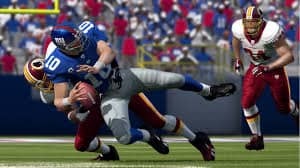 Regenerative Medicine has arrived and the ability to incorporate procedures such as Platelet-Rich-Plasma (PRP) and Stem Cell Therapy into the treatment and rehabilitation of professional football players who have sustained a torn knee meniscus has provided a useful treatment outlet. Meniscal tears have a variety of presentations and some become flipped up into the joint impeding function, while others do not obstruct the knee joint. The poor blood supply to the knee cartilage prevents healing and chronic problems arise. This is compounded by the fact that knee trauma is directly related to the progressive development of degenerative arthritis, and as surgery is trauma to the knee as well, this degenerative cascade is further exaggerated. Lastly, knee meniscal surgery may not be successful, these factors make an alternative to knee surgery more palatable for the professional athlete. Dennis M. Lox, MD, has provided Stem Cell Therapy to assist in the repair of musculoskeletal injuries for several years. Having done so he has treated a variety of athletes, yet the difficulties encountered when an elite football player sustains a knee injury is almost unparalleled. Most running and cutting sports place significant stress on the knee. The additional gladiatorial component of football heightens more contact injuries. Multiple professional football players have turned to Platelet-Rich-Plasma (PRP) during the season to assist in the healing process as it is easily administered. Stem Cell Therapy may be combined with the PRP, however the process is more extended requiring the harvesting of the stem cells from bone marrow and adipose tissue as compared to a simple blood draw with PRP. This generally adds a few days to the post procedure resting period. The main difference in a rehabilitation time line is allowing the cells to do their job adequately. PRP provides growth factors quickly for a repair mechanism. Stem Cells are more complex taskmasters. The Stem Cells orchestrate a myriad of signaling messaging locally to the injured area directing repair and regeneration. To fully allow full therapeutic potential it may take several months. However the application of the Stem Cells to a targeted injured area may provide a quick healing effect by inhibiting the destructive chemical mediators of the inflammatory process. This inflammatory response is part of the degenerative cascade for the development of post-traumatic arthritis which plagues knee injuries down the road and is further propagated by the addition of knee surgery which further traumatizes the knee bio-mechanically during knee arthroscopic meniscal resection. 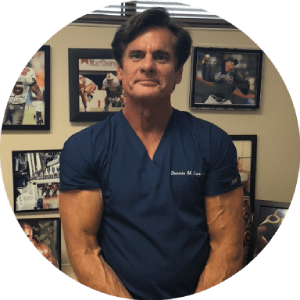 Dr. Lox has successfully treated many athletes including football players who have failed to improve after knee arthroscopic surgery. This can be attributed to a less than ideal surface area on the meniscus that is constantly irritated with the combination of a resultant inflammatory response. These type of injuries generally fail additional measures such as medications, corticosteroid injection, and therapy. Athletes are in excellent shape, devoid of other medical issues complicating recovery and a younger population, all favoring expedient recovery. Dr. Lox has seen typical 4 month Stem Cell Therapy recovery in these patients in 2 weeks to 1 month. Specific exercises can be done from day 1 post Stem Cell Therapy, and general non-knee strengthening and conditioning are not interrupted. Stem Cell Therapy in dealing with meniscal tears and failed knee arthroscopic surgery, may be a useful viable adjunct in the rehabilitation of the athletic injuries. The demands of football, particularly the professional ranks, has a variety of highly attractive merits to consider as a treatment measure.